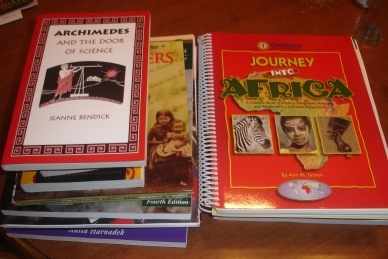 Yesterday our daughter Leah’s homeschool books for this year arrived in the mail. There’s always something exciting about seeing that big brown box at our front door, and we enjoy opening it to find new treasures. If you need some encouragement and ideas for the high school years, and good information on high school transcripts, SAT tests, and college preparation, check out Janice Campbell’s site here. The Homeschool Legal Defense Association also has articles and resources for homeschooling through the high school years and information on transcripts here. A great book to read on homeschooling through the high school years is All The Way through High School by Renee Mason and A Survivor’s Guide to Home Schooling by Luanne Shackelford and Susan White. Charlotte Mason’s Original Homeschooling Series is also an excellent resource for homeschooling from preschool through post-high school. My prayer for this homeschool year, as always, is for Leah (and I!) to have the best homeschool year ever, to learn a lot and have fun, that our family would grow closer in intimacy with Jesus and that God would be glorified in our lives. Each year I ask God to give me a scripture and/or a motto for the coming school year, and this year’s is Matthew 4:18-20. Do you have a special verse that God has given you to homeschool your child this year? Do you feel that the high school years are more of a challenge than previous years because of the tougher subjects like algebra and high level sciences? For my newest article on homeschooling (Charlotte Mason), click here. Thank you, Janice! That is so encouraging! I am really enjoying your site, too. The Lord bless you! Thanks, Suzie! That encourages me so much! I’m reading your second book now- am really enjoying reading them! I love the red chair on this book’s cover, too. Thank you for visiting my site, Beth! I’ve enjoyed browsing your blog–you’ve gathered some wonderful information. Enjoy your day!